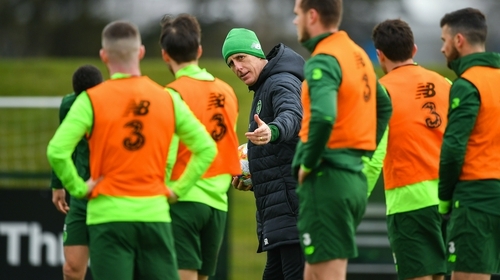 The Mick McCarthy era began, in earnest, at Abbotstown on the final day of the St Patrick’s weekend, as the new Ireland manager took control of his first training session with the squad. Gathering in Dublin ahead of the FAI awards on Sunday night in RTÉ, the squad took part in an open training session at the west Dublin venue ahead of the start of the Euro 2020 qualifying campaign. The road to the UEFA tournament, which is co-hosted by Dublin, kicks off on Saturday with an away trip to Gibraltar before McCarthy plays his first home match next Tuesday against Georgia. McCarthy’s 38-man provisional squad was chopped to 23 last week. However, there have since been changes with Callum O’Dowda, Alan Browne and Ronan Curtis forced to pull out of the squad. As a result, there were call-ups for West Ham’s Josh Cullen, who is currently on loan at Charlton Athletic, Burnley’s Kevin Long and Jack Byrne, who caught the eye in Shamrock Rovers’ 3-0 victory over Sligo on Friday night. Aston Villa midfielder Conor Hourihane, Sheffield Wednesday goalkeeper Keiren Westwood and defender Richard Keogh of Derby County are set to join up with the squad later today and should train on Tuesday. Sean Maguire and Seamus Coleman sat out the first training session and watched on from the sidelines, while Shane Duffy is also set to join up later today, having played on Sunday for Brighton in their FA Cup win over Milwall. McCarthy, however, appeared unconcerned by the amount of players missing out on his maiden session back in charge, 17 years after first managing the national side. "Seamus [Coleman] is fine - he was never going to train the day after playing. Equally, the lads who played on Saturday are only doing the minimum today. "We just want all the players right for Saturday. That’s just why some of them sat out. "Richard Keogh will be playing with a cast but that should get passed by the authorities." Preston striker Maguire looked on, wearing runners, which certainly raised a few eyebrows from the assembled media regarding the forward’s fitness. However, McCarthy again appeared unconcerned, while also suggesting that the striker will be involved in the opening game in Gibraltar on Saturday. "The clubs have different health and fitness protocols, and as you know, he has missed a lot of games through hamstring injuries, and his schedule at the club would be exactly what we are giving him. "Whatever they do to get them out on the pitch on Saturday, is what we will do. He doesn’t train on Monday. He’ll train Tuesday and Wednesday, and I think he has Thursday off. But that is only for a short time so they can get the best out of him in games. "So whatever Preston do that has him playing, playing well and scoring, I will adhere to whatever they want." Last man into McCarthy’s squad was Byrne, who earned his call-up under the watchful eye of the manager at Tallaght Stadium, where the former Manchester City prospect put in a man of the match performance, capped off with a wonder goal in the 3-0 victory. "He was outstanding the other night. I think he’ll have a harder time in terms of opposition, but even in training this morning, he is more than capable of mixing it with the lads there." McCarthy and his backroom team have been very visible around the League of Ireland grounds since the season kicked off in February, and Byrne’s inclusion will certainly give others confidence that they could be involved in future squads. "I guess if I’d have seen him the last time, and he’d have played like that, I’d have had confidence in him then, but I didn’t see anybody like that, so I guess that is the benefit of going to the games. He put in an excellent performance on Friday night."